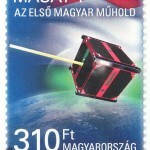 On 12 April 2012 – the International Day of Human Space Flight – the Hungarian National Bank (Magyar Nemzeti Bank, MNB) and the Hungarian Post Office Ltd. issued a commemorative coin and stamp to celebrate successfully putting Masat-1, the first Hungarian satellite into orbit. The coin and stamp were officially presented following the technical presentations on Masat-1, held in building Q of the Budapest University of Technology and Economics. The members of the Masat-1 team and the representatives of the university were given a coin and a framed first day cover by the representatives of the central bank and the post office. The commemorative coin designed by Áron Bohus and manufactured by the Hungarian Mint Ltd. is made of a copper-nickel alloy and has a face value of HUF 1000. It is the latest coin in the series dedicated to the innovations and inventions of Hungarian engineers and inventors. There are five thousand ’Proof’ (glossy) and five thousand ’BU’ (matte) Masat-1 coins. The Hungarian Post Office Ltd. issued 250.000 copies (in sheets of fifty) of the commemorative stamp designed by Glória Hefelle on 12 April 2012. The stamp has a face value of HUF 310 and is available as a first day cover for collectors. Both the coin and the stamp (and its accessories) were designed by the artists in cooperation with the Masat-1 team. The artists asked for our feedback several times during the design process. We often discussed technical aspects concerning the satellite, sometimes, however, we could also add to the artistic concept through our humble suggestions. Our team leader, András Gschwindt had the idea of drawing a parallel between the two sides of a coin and the two equally important aspects of the satellite mission: the space segment (the satellite itself) and the ground segment, i.e. the ground station, through which the satellite can be controlled and from where the data collected by the satellite can be downloaded. This inspired the idea of putting an image of the antennas of the Masat-1 primary ground station on top of building E of BME on the reverse of the coin. 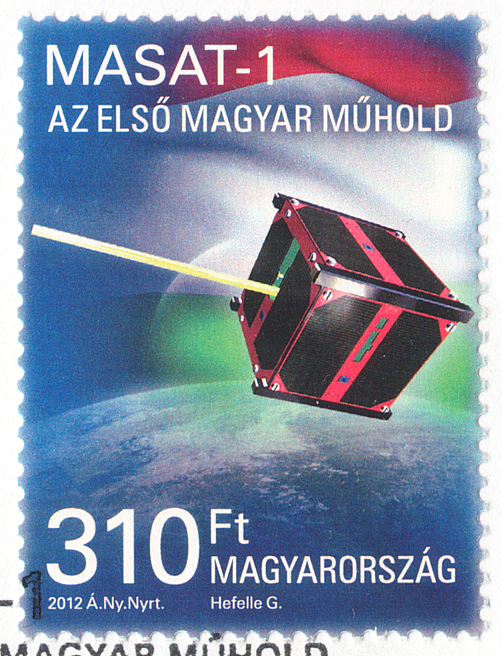 The coin and stamp issued to commemorate putting Masat-1, Hungary’s first satellite into orbit are probably unique, since as far as we know these are the first official coins and stamps depicting CubeSat class satellites. Our satellite was transmitting the ’MASAT-1 ON STAMP & COIN’ beacon signal on the day of issue. For photos taken at the event see our gallery.